As we saw yesterday, we have fitted additional armour to some of the cables. 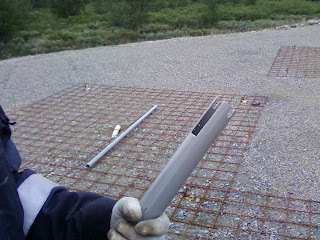 The only small setback is that the added diameter means that we need to adapt the base of the LBA aerial posts. Fortunately, this is easily done and there are not many to do. Incidentally, it may seem a bit odd that we are going into such painstakingly fine detail in this weblog.Surely we just want the glorious photographs of the finished product and the amazing data that it will produce. Well, this is certainly true. But this weblog also serves other purposes as well. It acts as a complete record of the work that we've done on the site. It also explains to our readers at ASTRON and EISCAT what modifications we needed to make to the standard LOFAR system to adapt it to the local Arctic conditions. And it is also a step-by-step guide for our colleagues on projects like POLFAR and I-LOFAR, helping them to understand the steps involved, how they are sequenced and what little challenges we meet along the way. So, yeah, sure... cutting a slightly larger slot in the LBA post may seem a bit trivial, but there is a really good reason for writing about it and posting it for public view.